Bharatiya Janata Party leader Mukul Roy accused West Bengal Chief Minister Mamata Banerjee of indulging in 'minority politics' in the state. KOLKATA: Bharatiya Janata Party (BJP) leader Mukul Roy on Friday accused West Bengal Chief Minister Mamata Banerjee of indulging in 'minority politics' in the state. “In West Bengal, Durga Puja and Laxmi Puja have stopped. Mamata Banerjee is indulging in minority politics,” Roy said, while addressing a rally here. He further said that the Bharatiya Janata Party (BJP) would come into power in West Bengal in 2019. “A change will come. The BJP will come into power in Bengal in 2019,” he said. Roy added that Mamata Banerjee had changed, adding that before coming to power, the Trinamool Congress’ (TMC) slogan was change, and not revenge, but six years later, the party’s slogan changed. Explaining his reasons for leaving the TMC, Roy asserted that the promises made by the party were not fulfilled. “The TMC is no longer a party, but a limited company. So I could not stay longer in the party,” said Mukul Roy. 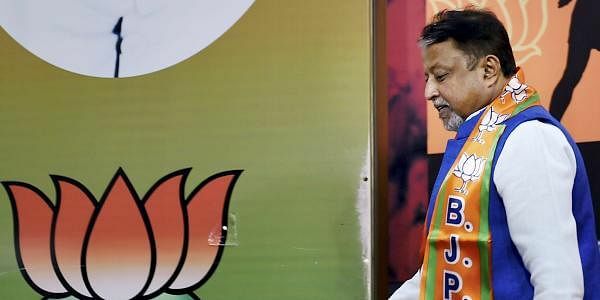 Mukul Roy quit the TMC and joined the BJP on November 3.